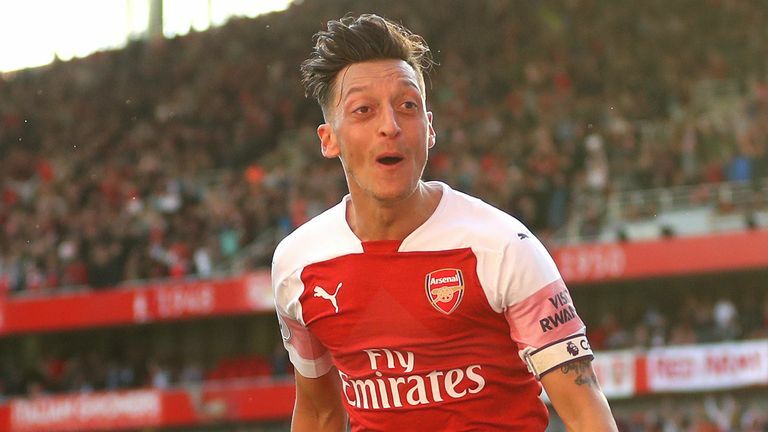 Craig Cathcart's own goal and a Mesut Ozil second gave Arsenal a flattering 2-0 victory over Watford for a seventh win in a row. 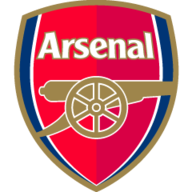 Alexandre Lacazette's pressure on Cathcart saw him turn Alex Iwobi's cross beyond Ben Foster with nine minutes to go at the Emirates, before which the visitors had enjoyed the better of the chances. Will Hughes had volleyed an early chance wide, Andre Gray had a one on one saved by substitute goalkeeper Bernd Leno and an Isaac Success effort glanced the post with the scores goalless. But once unconvincing Arsenal went ahead they quickly added another, Lacazette turning provider and Ozil firing home (83) to give Arsenal a seventh consecutive win, and fifth in the Premier League. Watford's confidence has not been shaken since their perfect start to the campaign was ended by a draw and a defeat from their last two games, and they pressed Arsenal from the off at the Emirates. But they could have been behind within five minutes, when Christian Kabasele's cumbersome challenge in the box caught Lacazette. The forward gallantly tried to stay upright but stumbled over a second later - and it was enough for referee Anthony Taylor to wave for a goal kick. Arsenal made one change from the side that beat Everton, with Rob Holding replacing Sokratis. 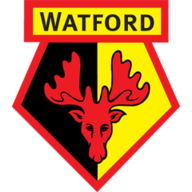 For Watford, Daryl Janmaat's injury meant Javi Gracia was forced to change his line-up for the first time this season, and chose Marc Navarro to replace him. Hughes failed to take advantage of that let-off when he planted a volley wide from the edge of the box minutes later, when he should have found the target given the time he had to shoot. An end-to-end game ebbed and flowed but Arsenal spent much of the game lacking imagination, and their best chance of the half came from a Watford mistake when Lacazette caught Cathcart in possession, before racing through and missing the far corner. Petr Cech was forced off with a hamstring injury just before half-time and his replacement Leno needed to be in good form after it, denying Deeney's toe-poke from a Jose Holebas free-kick with a brilliant diving save. It was his decisiveness rather than his reflexes which would then thwart Gray, when he raced off his line to narrow the angle when the striker was played through one-on-one and shot straight at him. What would VAR have changed? Ultimately, it would not have had an effect on the result, but had Anthony Taylor had a chance to review the decision not to give Lacazette an early penalty he would have changed his decision. But he was nowhere near keeping out Success' effort when the Arsenal defence again went to sleep and allowed him to find space in behind, and was relieved to see the forward's dinked effort brush the far post before going out. Arsenal's sighs of relief soon turned to cheers of delight when Iwobi's cross struck Cathcart's leg and bounced into his own goal, before Ozil doubled the lead from a rapid break with the visitors pushing forward for an equaliser. Will Hughes had a quiet time on the Watford right, and failed to really affect the game. Troy Deeney showed his excellent link-up skills, making a number of chances and using his strength well. Those goals extend the Gunners' winning run under Unai Emery for their longest run of Premier League victories since August 2017, but for the second weekend in a row their performance did not live up to the result. Watford have won only one of their last 15 away league games, drawing two and losing 12. Since returning to the top-flight in 2015/16, Watford have scored seven own-goals, more than any current Premier League side. Arsenal have scored 10 Premier League goals in the second half this season, a joint-high tally along with Manchester City. Bernd Leno is the eighth German player to play for Arsenal in the Premier League (also Gnabry, Lehmann, Malz, Mertesacker, Mustafi, Ozil and Podolski); only Manchester City have seen more German players in the competition (10). Arsenal playmaker Mesut Ozil has scored two goals in his last three Premier League games, as manay as he managed in his previous 18. Since the start of last season, Alexandre Lacazette has been directly involved in 22 Premier League goals for Arsenal (16 goals, 6 assists), five more than any other player. Holebas was the creator of a lot of Watford's good moments, including that Deeney toe-poke, and put in more good crosses (4) than anyone else on the pitch, while also keeping Bellerin and Aubameyang quiet for the most part. His crossing ability is not too widely known outside of Vicarage Road, but he is capable of sending in inviting, whipped deliveries from the left, and more than adept from dead balls too as he showed at the Emirates. Unai Emery: We are improving each match and that's giving us information to develop tactically and keep improving, but winning is the most important thing. 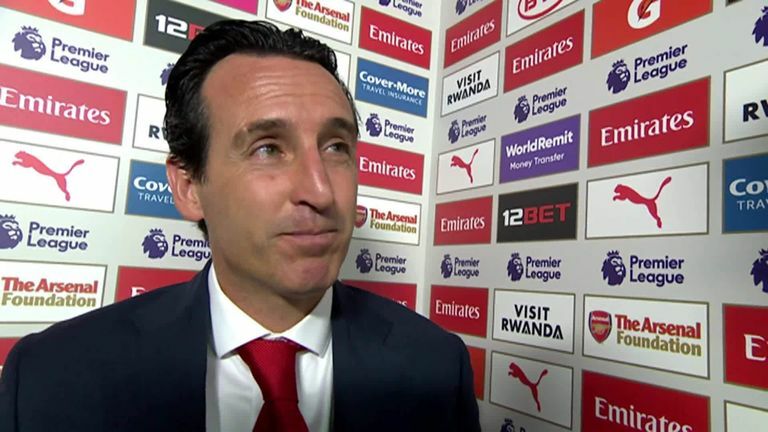 Unai Emery says he is confident that Arsenal will continue to improve after the Gunners secured their seventh successive win under their new coach with a 2-0 win against Watford. But when we are winning, we need to demand to continue to improve because there were a lot of things in the 90 minutes today which need to improve, but a lot of things we are doing well too. Javi Gracia: We had a lot of chances, clear chances, but we didn't score and it was the same as in one of our previous games, if you don't score after dominating the game. 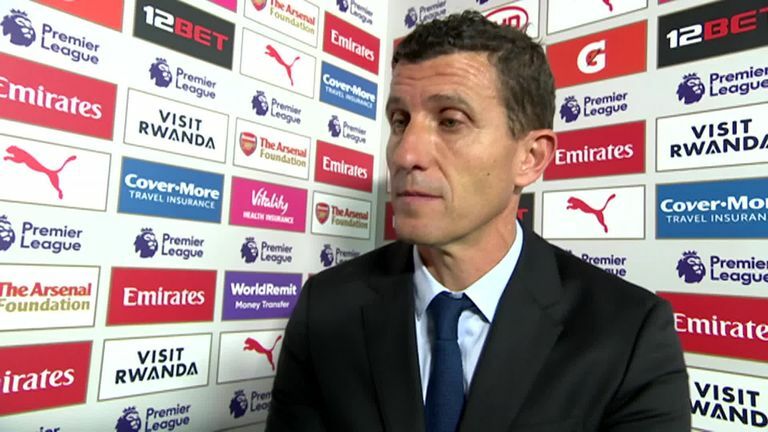 Javi Gracia says he is proud of his team's performance and believes they deserved far more out of their Premier League match with Arsenal. We had more chances more clear chances, more shots, more shots on target, and feel really good but at the end we didn't deserve the result. Arsenal travel to Qarabag on Thursday in the Europa League, with kick-off in Azerbaijan at 5.55pm. Watford face another 3pm start on Saturday at home to Bournemouth.